Why do you get angry at someone who is angry with you? Why to control one's emotions one hasn't any clue? Do you feel your anger will make you gain? Does your anger dazzle & make you feel in control? Have you ever tried holding a burning coal? By your anger, how is the other person going to lose? Your anger remains with you & can give the blues. Anger is like a fire that can spread fast & burn. Better to ensure that baseless anger is not born! But, figuring them out, timing & taming is worrisome. Release the flimsy anger, channelize the energy soon. Remember that most of the times anger is not a boon. Do you get angry with people? How do you deal with your anger? I rarely get angry. It is not a coal I want to carry. That's great! Thanks for sharing my blog's link & for stopping by, Donna. I used to get very angry but then consciously started practising meditation and mindfulness. Glad to say it's largely under control now. 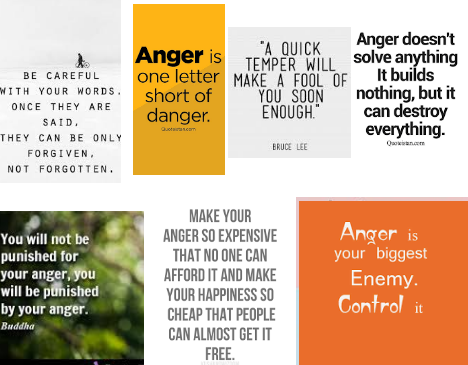 That's true, the Buddha's words on anger. It hurts you the most. Thanks for sharing your tips, Shailaja. True that anger hurts us. Became good at controlling my anger by trying to understand the other person's point of view. Also, making mail art helps to relax me - a form of meditation in some ways. Nice to learn about mail art. Creativity and artistic pursuits certainly uplift us. Wise words, Anita. With each passing incident where I let anger rule me i have learnt it is futile. Truly. Let us not allow anger to rule us. I do, but I`ve become better at managing my anger. It is super weighty, and usually accompanied by guilt (whether rational or not). I try to take it easy, think YOLO, and do something that mellows me out (i.e. listen to music, dance, bake). Like the post, Anita. I`ll be back to check in on you through the month. Thanks for sharing your anger-management techniques & for your appreciation, Marna. Interesting to read another post on Anger. I do get angry and have no problem admitting it. I don't act on my anger though but meditate about it. Its helped me understand myself better. Anger can take us on a journey of self-introspection & betterment, provided we are conscious enough to recognize & meditate. Good post to begin the challenge..Anita. Anger is something that only hurts us! Thanks for sharing your views, Vidyaji. Totally agree. We get angry about so many things- people disrespecting our nation, throwing garbage & spitting on the road, not following traffic rules...huge list. It's been so long since I've dropped by your blog, Anita. Don't know why! But I hope you remember me; Shalini from Tale of two tomatoes :) So glad that I could read you again through A to Z and I'm not going to stop coming back. Missed your writes! Lovely poem and yes, I am emotional and the outbursts are frequent. I am learning though. Hope I can keep a check on it! Of course I do remember you! Great to see you are in the challenge this year. I have been doing it for 7-8 years. I rarely get angry anymore. Guess I grew out of it or learned a few lessons. That's cool & great! Thanks for sharing. It's is my maiden participation in this challenge, Patricia. Thrilled to have wonderful company! Great tips, Swathi! Thank you. I get more irritated than angry but I think some of that is due to age/maturity. I'll be 70 this year and realize anger is a waste of my meager resources. Great post! I have experienced irritation being exhibited by people, who, unlike you, don't have the credentials of either age/maturity. Definitely anger is not a boon, hope we all could practice what is in this poem. Truly. Amen! Hope there are no angry people.